Background: Previous research suggested that obesity is associated with an increased risk of mental illness. Depression, stress, and anxiety are among the psychological problems that are commonly associated with obesity among students. However, evidence linking obesity to mental illness is inconsistent. Objectives: The objective of this study was to investigate the associations between mental disorders (in particular the depression, anxiety, and stress) and obesity in the male students of King Khalid University (KKU). Subjects and Methods: A cross-sectional study was conducted including male Saudi students enrolled in KKU at Abha City during the academic year 2013-2014. A multi-stage random sampling technique was adopted. Data were collected using the Arabic version of the depression anxiety stress scale. Results: The study included 389 university students. Their age ranged between 18 and 26 years with a mean age of 21.2 ΁ 1.5 years. They were almost equally distributed between four colleges (Medicine, Pharmacy, Sciences, and Languages and translation). Overweight was reported among 22.1% of the students whereas obesity was reported among 18.3% of them. The overall prevalence of depression, anxiety, and stress were 48.1, 58.9, and 40.4%, respectively. The association of obesity with depression, anxiety, and stress was found statistically significant (P < 0.001, <0.001 and <0.003, respectively). 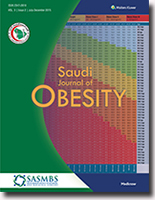 Conclusion: The prevalence of overweight and obesity are considerably high among male University Students in Abha. These findings suggest that obesity is associated with depression, anxiety, and stress. Prospective studies will ultimately be required in order to clarify the temporal relation between obesity and common mental disorders. Background: Obesity is one of the most common chronic diseases in Saudi community that affecting all ages and both genders. Objectives: The aim of this study is to estimate the weight status of pregnant women and its associated factors in Aseer Region, Saudi Arabia. Methodology: This cross-sectional study was conducted on pregnant women who were follow at antenatal clinics in primary health care center (PHCC) in Aseer Region during the period (3 rd to 7 th of November 2013). Data collection sheet was designed by the investigators to achieve the aim of this study. Working nurses in the antenatal care clinics were given written instructions regarding the objective, the importance of this study and how to measure the weight and how to fill data collection sheet properly. Data were coded and then entered into a personal computer provided with SPSS. Results: A total of 800 pregnant women attended PHCCs during the period of study. The mean age was 29.4 ΁ 6.3 years and about 50% of them were between 26 and 35 years old. Saudi represents the vast majority, and 85% of them were housewives. Mean of gravidity and parity were 4 and 2.5 respectively. Mean gestational age was 20 weeks, and rate of obesity and overweight were 32% and 38%, respectively. Conclusion: This study revealed that most of the pregnant women attending PHCC in Aseer Region were overweight or obese. Obesity rate increased significantly with advanced age and parity. Aims: This study aimed to assess the status of insulin resistance (IR) in overweight-obese women presented with missed abortion and to look for the presence of other cardio-metabolic risk factors. Setting and Design: This observational study was carried at Al-Yarmouk Teaching Hospital in Baghdad, Iraq during the period from March 1, 2014, to January 31, 2015. Materials and Methods: A total number of 60 patients presented with missed miscarriage and managed with misoprostol and, dilatation and curettage (D and C) were enrolled in the study. The data of anthropometric and blood pressure were collected. Fasting serum lipid profile, serum glucose, and fasting insulin were determined. IR is assessed by using the homeostatic model assessment-IR (HOMA-IR). 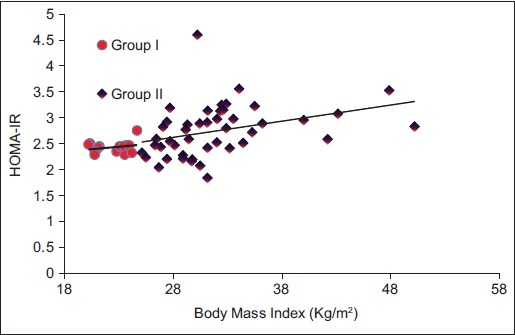 The patients were grouped according to the body mass index (BMI) into Group I (BMI <25 kg/m 2 ) and Group II (BMI ≥25 kg/m 2 ). Results: There is the nonsignificant difference between Group I and Group II in the characteristics and the clinical presentations of the patients. Significant high percent of the history of missed miscarriage observed in Group II compared with Group I (35.6% vs. 6.7%, respectively). Group II women significantly needed D and C intervention in addition to misoprostol therapy compared with Group I (75.6% vs. 13.3%) respectively. Although the blood pressure and lipid profile determinants are within normal levels, they significantly higher in Group II compared with Group I. Fasting serum insulin levels and HOMA-IR index are significantly higher in Group II (13.0 ± 0.5 μU/ml and 2.75 ± 0.5 μU/ml) than Group I (12.2 ± 0.3 μU/ml and 2.43 ± 0.11 μU/ml), respectively. Conclusion: Miscarriage overweight-obese women have significant IR as well as alteration in metabolic determinants. Misoprostol per se is not enough to produce spontaneous expulsion of the uterine content and surgical intervention is needed in these women.